We offer dorm beds designed for your comfort and privacy and cozy private rooms! Common space makes it easy to meet new people and make new friendships. Get lazy and chillout on our cosy backyard. 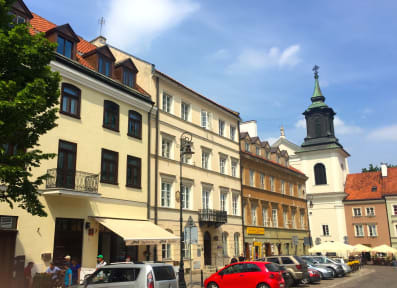 We are located in 18th century building, the only one left intact in Warsaw Old Town. This part of the city is listed as Unesco’s World Heritage Site! We are surrounded by restaurants and historical sites. Everyday you may join free walking tours to find out more about unique history of the city. Ask our staff about anything that interests you. We are young, we are bright, we know a lot about history of Warsaw as well as best party venues. For us passion becomes a way of living! Mingle with other guests - they range from newbies to veteran backpackers. Join us and feel like home! You are our guest from the time you pass the entrance until you leave - please feel free to use all our facilities any time you like. Arriving before check-in time (that is 3 PM) or want to hang out after check-out (11 AM)? Not a problem! Please stay in our common areas, have a a cup of coffee, take a shower or use the Internet. Hope to see you soon! Cancellation policy: 24h before arrival day. Payment upon arrival is possible by cash and Visa/Maestro Card. This property may pre-authorise your credit card. Minors are allowed only in private rooms with bathrooms in a company of their parent. Hostel offers accommodation in rooms with shared bathroom and dormitory rooms only to adults ( over the age of 18). For reservations for more than 8 people or 4 rooms, please use group reservation button. Reservations for 8 people / 4 rooms or more attempted to be made online could be considered as not guaranteed. There might be additional requirements for group bookings ( including 4 male only parties), like prepayments and group deposits. Reservations for New Year Eve require full and non-returnable prepayment by the 15th of November. Reservations made after that date need to be prepaid as soon as possible. For the New Year’s Eve we accept reservations only for two days and more. If you’d like to choose other payment option than charging your credit card please let us know while making your reservation. Thank YOU! The hostel is in a great location, located right in the middle of all the touristy sites. There is a milk bar/bar mleczny located diagonally across from the hostel that I would recommend for the experience and if you’re on a budget. I was in a 6-bedroom dorm. The room and en-suite bathroom were very clean. I also appreciated not having to put on the bedsheets myself unlike at some other hostels. Very comfy beds and super friendly staff! Lovely staff, excellent rooms with "private" curtained off beds with nice single bathrooms for each dorm. Excellent location near old town. Best hostel I have ever stayed in. Basic breakfast served 8-10 (milk, cereal, toast, tea/coffee) Bunks are spacious with a large swipe card locker for each person that can fit all your belongings. Showers are very good: to a standard you would have at home. Staff are warm and friendly. 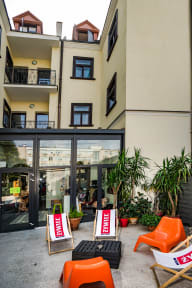 Social atmosphere but also space for yourself - not a party hostel. Location is very good. Price very good. This is the best hostel I’ve stayed in! First of all - the best staff ever! Alicja is the most informative, helpful, and beautiful person, and she gave me wonderful recommendations on what activities to do and where to eat. Secondly, location is perfect. Five minutes or less walk from the Old Town Square. Lastly, the hostel itself is super nice - comfortable bed, lockers that lock with your room key, hot showers, and a relaxed vibe. I absolutely loved my stay here and can’t wait to return! The best hostel I ever stayed in. Awesome location, very nice staff, super clean and great rooms. Every bed has a curtain to ensure some privacy, an outlet and a huge lockere where even a suitcase fits in easily. Small breakfast is offered, but it’s just some cereal and toast. There is a bar and some common area, which is nice to hang around.